This shop not only prides itself on its sushi, but also on its affordable kamameshi (a rice dish cooked in an iron pot). The crab kamameshi is the most popular. 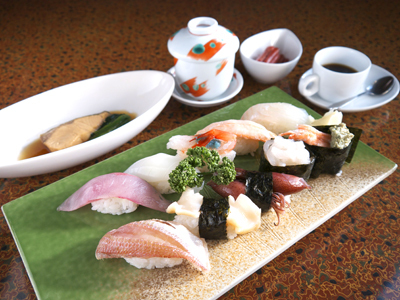 The assorted lunch set is fairly affordable at 1,260 Yen. Each reservation comes with 3 small bowl dishes, for a hearty feeling. This service with lots of discounts is sure to leave you satisfied.